Set up a photo gallery for the pack meeting by painting a backdrop made up of the bodies of storybook characters you choose then cut out the face. At the pack meeting invite Cubs and their families to have their pictures taken as their favorite legend. This is a good one for pack meetings. Have the boys and parents get together to solve this. Some the parents will know about and some are strictly for kids. 1. One For All, and All For One! 2. Elementary, my dear Watson. 5. Head for the raft, Jim. 6. If I only had a heart. 8. Take a bite out of crime. 9. Only you can prevent forest fires. 10. It’s not easy being green. 11. Vodka Martini, shaken not stirred. 12. It ain’t over til the fat lady sings. This is not set up to be a matching game. 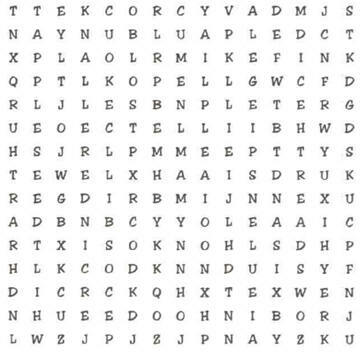 Find the following words in the puzzle above. Words may be diagonal, horizontal or vertical. Words may be forwards or sdrawkcab. Give your Cub Scouts a sheet wit these riddles when they arrive. See who can get all the answers. By using these clues and just one other. Guess what I am and you’ll score a hit! I’ll help you seek if you use me well! You can find me – take a look! As a source of more facts, I’m a real gold mine! Unlock all these clues by using this key! I am the organizer, I am the key! When you use a reference book, you need me. I am the __________, you see. I’m on every page and my job is to lead! I’m always the first, and I’m always the last. If you use me, you will find things FAST! Match the person with the sentence they said. 1) Called “Little Sure Shot” as a child, she grew up to star in Buffalo Bill’s Wild West Show. 2) He once rode a cyclone through four states. When he leaped off, his landing formed Death Valley, California. 3) This character is not fictional. This mighty steel-driving man had a rock drilling contest with a steam drill and won. 4) An expert hunter, horsewoman, sharpshooter and scout, this colorful Wild West character risked her own life to nurse smallpox patients back to health in Deadwood, South Dakota. 5) This might man of steel would stir boiling pots of molten metal with his bare hands. When the steel mill he worked in became too small, he melted himself to make more steel for a larger building. 6) This boy and two of his friends outfitted a river raft with supplies and floated into the endless Mississippi River adventures. 7) He became the most famous lumberjack of all time. He and his pet ox, Babe were used as advertising for the lumbering industry. 8) He killed a bear when he was only three. He as a true historical character and he died at the Alamo. 9) He lived on his father’s hacienda in Southern California. Hiding his identity behind a mask, he would ride to protect the cruel governor’s victims. 10) He was a Christian missionary who planted apple orchards in the wilderness. 9. “Zorro” Don Diego, 10. Johnny Appleseed. As people arrive, put half of a book title on the back of each person – the second half goes on the back of another person. They must ask questions that can only be answered with “yes” or “no” in order to discover what book they represent. As people arrive, put stickers with book titles on the backs of about half of the people. Put stickers with the authors names on the other half. Participants must ask questions that can only be answered with “yes” or “no” in order to locate the author of their book or the book they wrote. Using characters from books, i.e., Pollyanna, Anne of Green Gables, Harry Potter, Ron Weasley, Benny Alden, etc., make small tags with the names of the characters on the backs of boys and parents (if at pack meeting). Asking any questions that can be answered yes or no, the individual tries to figure out who his character is. For example you could write it in the one used in ancient Greece, where the words were written on wood or stone as if a farmer were plowing his field. The text might start at the top or bottom, but at the end of the line, the words didn’t go back to the original side, but continued on – this is called Boustrophedon text or literally, “ox-turning.” See if you can read this message or write a Cub Scout related one for the boys or families to decipher. After they have deciphered a message, have each of the boys write their own. Hint: Start at the bottom left corner. In the library, books are sorted according to a system. Most public libraries use the Dewey Decimal System. Many academic libraries use the Library of Congress system. You could also add the actual titles of some books. This could be a Gathering Game as well, with each family being a team and working together. Equipment: A card for each player with half a simile on it. ü Write half a simile on each card. ü Give the first part of the similes to one group and the last word to another group. ü Then they need to match up the cards. You could also create a matching game using the facts. For example, list various kinds of books or book discoveries opposite a list of answers. Figure out who each of the mixed up names are. Not all of them are people. Make signs with the names of the characters from the books that you have been discussing. When the boys enter the room, pin a name on every boy, making sure that the boy does not see whose name is on his back. Each then has to go around the room asking questions of the other boys which can be answered with "Yes or No.” The first one to correctly figure out who he is wins. 12. A steamboat l. Robin Hood.